Episode 3: Get Your Doodle On & Sketchnote! Source: Stewart Sevastos. Southbound Festival 2011. Public Enemy @ Sir Stewart Bovell Park. Jonathan shares his musical magic! Music Memos : Listen here. Auto Rap on Google Play, iTunes: Listen here. Wunderlist helps you get your to-do list organized across devices. Breakout Edu brings problem solving and collaboration into your classroom. OneNote super-charges your organization (even recipes!) with this powerful tool! The Snagit Chrome Extension will take screenshots and screencasts or a 20 second GIF! Pixabay is a free resource of high-quality photos with Creative Commons Zero licenses. If you have edtech tools that you love, tell us what theyare and why you love love them by emailing podcast@gwaea.org or by connecting with us on Twitter at @DLGWAEA and we will share the best ones on a future episode! Get Your Doodle On & Sketchnote! Using visuals, text, and organization to create awesome notes! It is an extension to rethink learning. Students can bring learning to life with their own perspective. It also improves depth of conversation among students. ​handwritten notes are more effective than typed notes. Personalizing notes and depicting thought processes increases recall and comprehension. 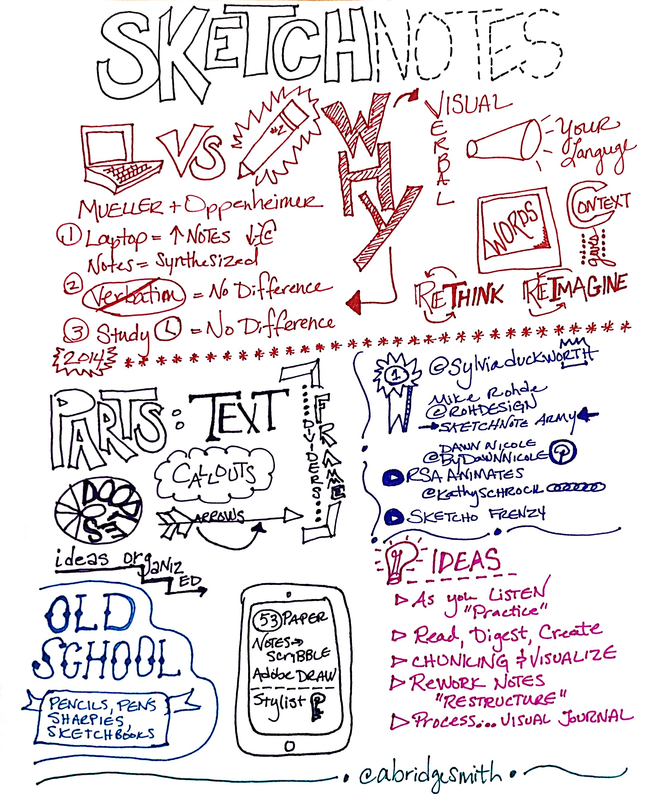 Consider planning ahead when ‘live’ sketchnoting! Save a webpage as a PDF on the iPad and add it to iBooks as seen on the left. Bloomboard adds badging! Create collections of articles around a topic. Show competency in using new strategies and earn micro-credentials! Check out the link to the article. Connect with us! We love hearing feedback, so tell us what you think and send us all your suggestions for future episodes to podcast@gwaea.org. You can also record a voice memo on your phone and email it to us for a chance to have it played on the show! If you are a fan of The Edtech Take Out, please subscribe on iTunes and leave us a review. This helps us more than you know and is the best way to show your support for the show.